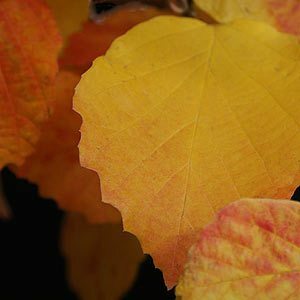 Fothergilla major Mt Airy is one of the best cultivars, larger leaves and generally a better form than the species this is an excellent plant for autumn color. The large leaves are heavily textured with an attractive blue green colour. However it is the autumn tones of red, orange and yellow that makes this a standout. Flowers have a pleasant aniseed fragrance, and this smaller growing or ‘dwarf’ cultivar will grow well in full sun to part shade. 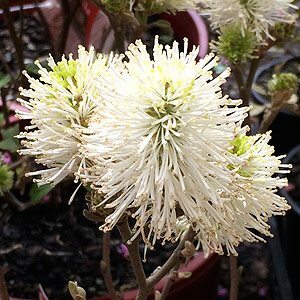 In the garden, use Fothergilla major Mt Airy as a feature plant, or tuck it away at the back of the border with lower growing plants in front. Flowers are an added attraction creamy white appearing on bare stems, reminiscent of bottlebrush flowers but softer in form. Reaching around 2m in height plant Fothergilla major Mt Airy prefers a humus rich moist but well drained soil. It is a suckering shrub and although it generally requires little pruning, removing old growth every second year will keep it neat and vigourous. Position – Part shade to ful sun, humus rich soil, keep well mulched. Flowers – Showy white flowers in spring with a subtle fragrance.